4th century in Saint-Ursanne, Switzerland, a very fancy baby lived. No one knows the baby's name, but we know that the baby was bright because of their small beautiful shoes: intricate decorated leather ankle boots with buttons and clamps. Archaeologists uncovered fragments of this well-preserved and sincerely adorable artifact during an ongoing excavation of an old town in Switzerland's Canton of Jura, according to a story in Local Switzerland. After the last seven centuries of immersion in the groundwater of a large wet depression left at the Doubs River, the baby boot jumped under the cobblestones of the eastern part of Jura's old town. Archaeologists quickly brought the boots to Marquita and Serge Volken, who work as ski specialists at Lausanne Sko Museum, according to a statement from Jura Kulturkontor. The Volkens identified the boot as a particularly rare find that entered the line of only five other well-known shoes of a similar design, which were previously permeated in Europe. Volken believes that the shoe probably belonged to a one-year-old child. The fragment measures about seven to five inches, with a top made of goat leather and a sole of colder leather. But perhaps the most amazing facet of the boot is its decoration. The dust gate of the dust is a finely etched floral motif with leaves spread out of the tongue, while the heel has a geometric arrangement of squares. Apparently, power interruptions in the Jurassic were in the 14th century. Today, Jura is still a remarkably medieval place with preserved Romanesque architecture still facing the canton. The town of Saint-Ursanne also hosts a medieval festival every two years in July, where people dress up in clothes and participate in activities of the era, including forging and catapult construction. And the Jura canton has a unique claim to prehistoric fame, as the surrounding mountain range dates back to the time of sauropods and thus names the jury period. 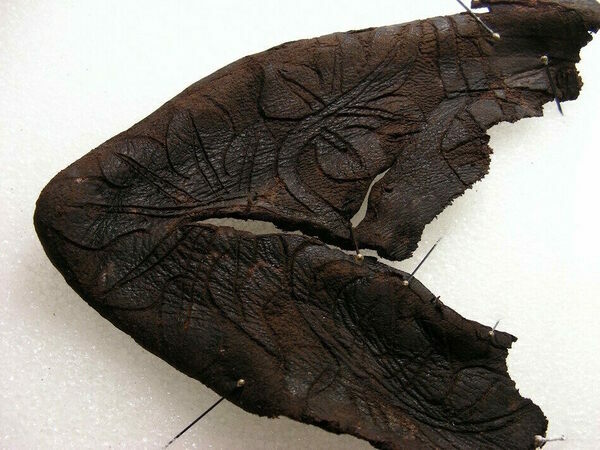 Organic material such as leather and wood can be well preserved with water logging, the anaerobic process that occurs when an artifact is soaked in groundwater without access to air, according to a report from Historic England. Water logging – which often happens in bogs – can create immensely perfect conservation. Just imagine the forehead of the fourth century BC Tollund Man or the lingering scent of century old moss butter. Although perfect for topographic details such as blade cuts or laughs, water logging cannot preserve the color of the artifact they engrave, immersing the original colors in this nubrune boot. Meanwhile, in Jura, the excavation continues and leaves the hope that this lone bootie can be reunited with his mate.